March 19th in Round O, South Carolina @ 1 PM. Carl Walsh called this bird in and I harvested him with a 40 yard shot using 3' Federal Premium #5's, and a Primos Undertaker Choke. The Tom weighed in at 22lbs, with 1.25 spurs, and a 9.5 beard. 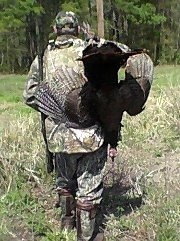 This was the largest bird harvested on the property according to one of the land owners.